How Effectively Do State Health Departments Use #SocialMedia? How will you know if there is a #publichealth emergency in your area? Whether it’s an #epidemic or a #terroristattack, it’s important that the public be informed quickly when serious situations arise. Although national outbreaks and disasters get covered by the media, localized incidents are not as widely publicized. Social media gives state health departments an easy way to get the news out to the people who are most likely to be affected by the situation. Although many state health departments are using social media platforms to get the word out about public health concerns, some are doing a better job of it than others. To determine which health departments truly excel, the MPHProgramsList.com staff embarked on another time-intensive project, this time evaluating the social media presence for 51 health departments (50 states + DC), and ranked them all from best to worst. The highest possible score is 100, with 40 points for Twitter, 30 for Facebook, and 30 for YouTube. 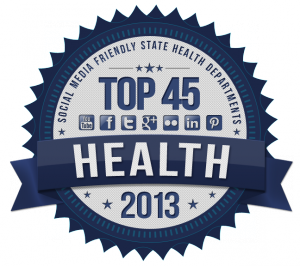 If your state health department is listed and you’d like to spread the news, feel free to use the Top 45 Badge above on your department’s website, blog, and social media accounts. The Arizona Department of Health Services is concerned about animals too, not just people. They recently tweeted the link to a document that lists the common symptoms of Valley Fever, a fungal illness affecting dogs. Arizona is the only state that has accounts on Pinterest and Google Plus. The California Department of Public Health has recently posted tips for gardening safely and protecting yourself against ticks on its Facebook page. California is one of only four states that have a presence on Flickr. The Florida Department of Health promotes special events such as National Walking Day, Public Health Week, and even a tobacco-free beach party through its Facebook account. The beach party was part of Tobacco Free Florida week. Michigan turned the 5-mile-long Mackinac Bridge blue for Autism Awareness Day on April 2nd. The Michigan Department of Community Health frequently posts about issues related to developmental disabilities. A recent outbreak of norovirus among students in the Anchorage School District has resulted in several norovirus-related posts by the Alaska Department of Health and Social Services. The biggest takeaway: Wash your hands frequently, especially before handling food. Did you know that, because cervical cancer grows slowly, you only need a Pap smear every three years if you are a woman aged 30 or over? Thanks to a post on the New York State Department of Health’s Facebook page, now you do. Louisiana’s Tobacco Control Program is an effort by the Department of Health and Hospitals to create a tobacco-free state through awareness, smoking cessation programs, and policy changes encouraging schools to ban tobacco use even during sporting events and other activities outside of normal school hours. A video on the Connecticut Department of Public Health’s website advises the public to “just wash your hands.” Sure, you learned that in kindergarten, but can you believe that about half of people who use public restrooms don’t bother? Just wash your hands. Is it OK to eat lunch at your desk? Sure, as long as you make sure to wash your hands first and keep your lunch properly refrigerated. I’m surprised they didn’t say anything about all the germs on your keyboard, though. Going back and forth from keyboard to lunch can’t be a good idea. Don’t throw away your used wine corks. They can be recycled to make shoes! A post on the Kansas Department of Health and Environment’s Facebook page links to a page that tells how corks are ground up and recycled for use in making SOLE shoes. What is Public Health Week all about? It’s about clean air and water, safe communities, healthy schools and workplaces, disaster preparation, and disease prevention. Public Health Week is about saving lives. Now that winter is over, thunderstorms are the biggest weather-related threat in many areas. Check out the Minnesota Department of Health’s Facebook page for information on keeping your food safe during a power outage. According to an article the TN Department of Health tweeted about recently, antibiotics are losing their effectiveness due to unnecessary prescriptions and patients’ failure to take the full course. These problems lead to strains of bacteria that are resistant to antibiotics. The Washington State Department of Health is warning the public to watch out for ticks. In addition to Lyme Disease, which most people are aware of, ticks can also transmit Rocky Mountain Spotted Fever and Relapsing Fever to humans. The Oregon Health Authority has given a lot of attention to discussions about Oregon health reforms lately. These talks have to do with the state health exchange, Cover Oregon, and the expansion of the Oregon Health Plan to cover additional low-income residents. A new report linked to from the Georgia Department of Public Health’s Facebook page indicates that the state has recently dropped from 2nd in the nation for childhood obesity to 17th. The Georgia SHAPE program, which began in 2009, may have helped bring about the change. The Arkansas Department of Health recently tweeted about a rabies outbreak in Pulaski county. Three rabid skunks have been found recently in the county. Since skunks can transmit rabies to domestic animals, residents are advised to make sure their pets and livestock have up-to-date rabies vaccinations. The Colorado Department of Public Health and Environment recently shared an infographic on its Facebook page that shows what it would mean for Colorado to be #1 in health. Among the statistics are 32,600 fewer high school smokers and 376,800 fewer adult binge drinkers. The State of Delaware Division of Public Health encourages visitors to its Facebook page to get tested for STDs during April, which is STD Awareness Month. Because symptoms don’t always show up right away—if ever—STDs often go undiagnosed and untreated. Hawaii public health officials are on alert due to a new form of bird flu that has killed seven people in China. Although there have been no known cases in the US, Hawaii many residents who travel to and from China frequently. Incoming international travelers who appear to be sick are being tested as a precautionary measure. A video on the Vermont Department of Health YouTube page provides warning signs parents of teens should watch for to detect the use of alcohol. Some of the signs include sudden increased irritability, memory lapses, and drastic changes in sleeping patterns. The Maryland Department of Health and Mental Hygiene recently announced the receipt of a $249,700 grant to be used for breast cancer awareness among low-income women with no insurance. They grant came from Susan G. Komen for the Cure. Right now, the latest tweet by the Massachusetts Department of Public Health provides a phone number for anyone in need of crisis counseling in the wake of the Boston Marathon tragedy. Do you know what you’ll do if there is a tornado, hurricane, or flood? A video on the Texas DSHS YouTube page emphasizes the importance of having a plan so your family knows what to do in case of emergency. There are many STDs that can be treated and cured. Delaying treatment can lead to infertility, so get tested to protect your future ability to start a family when you’re ready. The state of South Carolina is considering putting restrictions on the types of foods that can be purchased using SNAP benefits. The Department of Health and Environmental Control links to an article about eating healthy on a food stamp budget as part of the debate. The Indiana State Department of Health’s Twitter feed contains the link to an infographic outlining the September 2012 fungal meningitis outbreak. The outbreak, which was traced back to contaminated steroid injections, killed 50 people. Gestational diabetes doesn’t always go away after pregnancy. If you are diagnosed with this condition, make sure you go back for your follow-up visit to get tested again after your delivery. Women who have gestational diabetes have an increased risk of developing type 2 diabetes later. Through the Ohio Department of Health, children in 51 Ohio counties have school-based access to dental sealant programs. The program targets schools with a high percentage of low-income families because these children are more likely to develop cavities due to lack of dental care. The New Hampshire Department of Health and Human Services is keeping the public informed about sexually transmitted diseases through its Facebook and Twitter pages in recognition of STD Awareness Month. The Illinois Department of Public Health recently tweeted the link to an article about a study that examined whether kids eat more fruits and veggies if state law requires the school to serve them. The study found that kids at roughly half a cup more fruits and veggies per day in the states that required schools to serve them. The Virginia Department of Health reminds residents to check their wells after heavy rains. Storms and flooding can introduce disease-causing microorganisms into the water supply. If there is flooding near your well and you are unable to test the water, boil or treat it before drinking until you are able to get it tested. With the help of volunteers, Montana DPHHS staff placed 1,000 blue pinwheels on the Capitol lawn in recognition of Child Abuse Prevention Month. This event was part of the national Pinwheels for Prevention public awareness campaign. Colorectal cancer affects men and women equally and is the 2nd most deadly cancer in Iowa, behind lung cancer. Approximately 90% of colorectal cancers can be treated successfully if they are detected early enough. An investigation of a Tulsa-based dental practice by the Tulsa Health Department and the Oklahoma State Department of Health found that oral surgeon W. Scott Harrington was not using proper procedures to control infections. Approximately 7,000 former patients are being tested for Hepatitis B, Hepatitis C, and HIV. The North Dakota Department of Health recently posted about a car seat roundup on its Facebook page. The roundup was an effort to keep unsafe car seats from being reused. Residents were able to exchange old, damaged, recalled, or otherwise unsafe car seats for a $5 gift certificate good at local businesses. A video on the North Carolina DHHS’s YouTube page reminds us that pregnant women never drink alone—the baby consumes whatever the mother drinks. Fetal alcohol syndrome can cause babies to have low birth weight, heart problems, learning disabilities, and other problems. Check out the developmental milestones linked to from the Idaho Department of Health and Welfare’s Facebook page to find out if your child is on track. The first five years of a child’s development are crucial, so if you are concerned about your child’s progress, err on the side of caution and have him or her evaluated. The DC Department of Health announced the completed of the Community of Hope’s new health care facility in the Bellevue neighborhood. The new facility has 20 exam rooms and will provide services to approximately 10,000 patients. The Kentucky Department for Public Health has posted flu updates on its Twitter feed throughout the flu season. The department encouraged pregnant women, the elderly, and others who are at increased risk for flu to get their flu shots. The New Mexico Department of Health has a video on their YouTube account on bonding with your baby. The video shows several parents talking about how they bonded with their babies through breastfeeding, holding and carrying them, playing with them, singing to them, and more. There are parts of Wisconsin that flood every year. If you live in one of these areas, keep clean drinking water on hand and test your well after the flood waters recede. You can find more tips on this page, which linked to from the Wisconsin DHS Twitter feed. The governor of New Jersey has issued a set of guidelines for residents who are dealing with mold in their homes as a result of Hurricane Sandy. The pamphlet is available online in .pdf form. It is also being distributed in print form through county and local health departments. We were unable to find Facebook, YouTube, or Twitter accounts for six state health departments. We hope that listing them here will spur them into action so that residents in these states will be able to subscribe to public health updates in the near future. If you want to stay informed about the latest public health news in your area, following your state health department on Facebook or Twitter is a great way to do it. Take a few minutes right now to check out the links we’ve provided for your state health department’s social media accounts and follow them. Next time there is an important health update in your area, you’ll be one of the first to know about it. Notes: If you notice a mistake in the social media information provided in this article, please let us know. If your Social Media accounts are not easily visible on your homepage please make this change today.